OhGizmo Review: The Sleeptracker Watch | OhGizmo! These should be good times for the folks at Sleeptracker, having had their product listed as one of TIME.com’s 25 Best Inventions of 2005. I happen to have been testing their product for the past two weeks, and here I give you my impressions. A quick recap first. 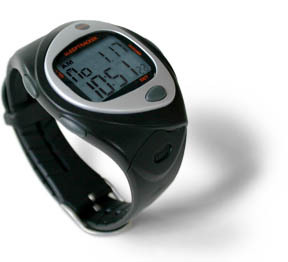 The Sleeptracker watch, aside from telling the time, also monitors your sleep and wakes you up at the “optimal” time. During the night (or the day, if you’re that way), your sleep normally fluctuates between “passed-out cold” and almost awake. The best time to wake up, of course, is when you’re almost already up. So the watch keeps track of these moments, and should one of them fall within a window you set, it’ll wake you up then. The theory is that you’ll feel fresher if you wake up right at 7:15 than wrong at 7:30. So does it work? Does it live up to the hype? In short: yes. In long: yes, but. Come inside to find out what I mean. Let me start by saying you’re not going to get any live shots. The watch looks exactly as it does on the picture there, and all I could have given you more is a picture of the hair on my arm. I’m sure you’ll thank me for sparing you this. Now, the watch itself looks ok. The bands are made from a rubbery, plastic-y material and are quite pliable. They always bounce back to their original shape and my cat wasn’t able to leave tooth marks when she confused it with her treats. Also, they are quite ingeniously designed. See, for the watch to work properly, it’s best if it’s kept against your skin, rather than hanging down loosely. Since people have wrists of many different girths, the straps were designed with 11 closely spaced holes, allowing you to adjust it properly, no matter how meaty or measly you are. It wouldn’t win any style competitions, for sure, but hey, it’s a watch you’ll buy for the functionality, not the looks. You won’t get arrested by the fashion police either, so don’t worry. It’s understated, rather minimal, and that’s fine. The way the watch works, from what I could read, is by integrating an accelerometer. That’s also known as a motion detector. The idea is that when you’re at your lightest moment of sleep, you move around. It true, at least from my experience. I sometimes remember tossing around in bed, and I later think “Hey, I almost woke up right then”. So what you so is set the time you want to wake up. Say, 8AM. Then, you set a window of time, up to 30 minutes. That means that starting at 7:30, it’ll wake you up as soon as you move a muscle. If that happens to be 7:35, then that’s when it rings. If, by 8:00 you’re still a lump of wood, then it’ll go off anyway. Also, you can set your “Bed Time”. Since the watch cannot tell the difference between your movements when you’re sleeping or awake, you have to tell it when you expect to be sleeping. This allows it to track how many times during the night your sleep cycled and how long those cycles were. This is useful because a longer average sleep cycle time means a deeper, more restful sleep. Oh yeah, it’s also water resistant. So, does it work. Well, yes. It does. But, not always. I have to quickly point out that this is certainly not the watch’s fault. More on this in a second. When the watch did work, it was always right after I moved around a little in bed. As it’s supposed to. I then got got, and actually did feel more energetic than other times I’ve woken up in, say, the middle of a dream. You know perfectly well what feeling I’m talking about. Sometimes you take a nap, and someone wakes you up rudely. It’s so uncomfortable, you’ll get a headache. Other times, you’ll just get up, feeling full of energy, like you’ve been recharged. The times the watch worked, I felt exactly like that. So why didn’t it work all the time? Well, I have to say, I have a very strange, very varying sleep schedule. And in many occasions, I get less than 5 hours of sleep. On several occasions, I simply did not move during the 30 minute window and the watch simply went off on time. I get the feeling this watch will work a lot better with people who lead regular lives. Busy professionals who wake up at similar times every morning, for instance, would definitely get a boost from using this. Also, I found that the feature that allows me to review the average sleep cycle time was very useful. On nights where that figure was larger, I did actually feel more rested on the following morning, and vice versa. So keeping track of that number is a good way to see if you’re getting enough sleep every night, or if you’re doing something wrong and need to fix it. All in all though, it did what it claimed to do. And it did so at a very affordable price: $150. Would I change anything? Well, yes. But these things are minor. I’d like to be able to set the window to more than 30-minutes. That’s just me though. I don’t mind waking up one hour before I’m supposed to, so long’s I feel energized. But other people might disagree. I’d like it to ring a little louder. I never just slept right through the ring, but I came close a couple of times. I’d like it to be easier to set. You have to press the buttons pretty hard, and hold them pretty long to get them to work… but well, whatever. I’m splitting hairs. The guys at Sleeptracker have produced a wonderful product. This has the potential to change lives, for the right people, and for me to say this about a watch is not a small thing. Wakes you up with more energy. Works better for people with regular schedules. A little difficult to set. i totally thought i had thought of this all my own. AHH! i feel like one of those people on the patent commercials! Looks like a normal watch to me. $150 for this extraordinary watch looks affordable.